In the summer of 1861, Orson came to Utah with his brother Reuben and his family in the David H. Cannon Company. Bartlett Tripp, who was Company Clerk for the David H. Cannon Pioneer Company in 1861, included a list of company members in his Camp Journal. Listed were Reub. B. Eggleston, wife and 1 child, Orson Eggleston, 4 oxen, 1 cow, 1 wagon. The Company was organized in Florence, Nebraska Wednesday May 29, 1861 by David Gates who was President of the Western Emigration. 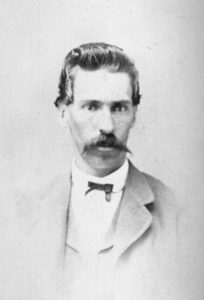 David H. Cannon was elected Captain. Captains of tens were W. E. Jolley, Wm. Tanner, Wiley Thomas, Wm. Hitchings, with P. B. Jolley sergeant guard, Bartlett Tripp clerk, Isaac Harrison chaplain. That evening a dance was held for members of the Company. Also included were many friends and family members who had “come out to bid them adeu”. The entire Eggleston family and friends were probably in attendance at this dance to spend some time together before their separation. The Company broke camp the next morning and began their journey, with the first few days being rainy and muddy. This company experienced its share of accidents, bad weather, Indian encounters, stampedes, and deaths. Bartlett Tripp added some interesting commentary to his record. Upon reaching the Platte River, he called it a “big muddy stream”. He also mentioned that the “Little Capt., as he is dubbed, is becoming very popular with the camp.” The evening of Sunday June 9, after some preaching, there was a baptism of 15 people. A “famous storm” struck on Wednesday June 12 as they reached Wood River with “hail stones full the size of an egg”. There were periodic hunting expeditions for buffalo and other game, but most of them were unsuccessful. 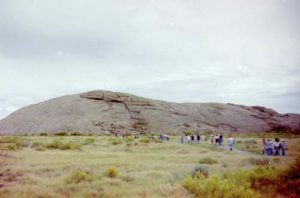 On Friday June 21, a group of Souix Indians came into camp, bringing much welcomed Antelope meat. The pioneers traded flour, bread and sugar for moccasins, robes and skins. Apparently the excitement of this visit resulted in frightening the animals and causing a stampede. Several wagons were damaged, one overturning completely breaking the axle. The next day there was another stampede of a few wagons, caused by running of loose horses. One wagon had a wheel broken, one woman was run over and a man’s thumb badly crushed. There were some deaths along the way, including Old Man Cheney, Mr. Harrison’s son, and Bro. Thomas’s crippled little girl. These were attributed to Mountain Fever. Bro. Tripp eulogized them in his camp record. A history of Reuben’s wife Emeline, written by daughter Disey Richardson, mentioned the hardships of the long journey across the plains, but indicated that Emeline enjoyed the pleasures life could give. She had a treasured Hymn book, which she enjoyed singing from along the way. The Company was divided at a point during the trip, because of the scarceness of feed for the animals. They also had contact with other Companies traveling along the trail. The Company arrived in the Salt Lake Valley August 16, 1861. The rest of the Eggleston family remained in Council Bluffs until 1862. Orson mentioned in a brief biography that “in the spring of 1862 I was called to go to the frontier as a teamster and in 1863 I was called and went the second time, went to the little town of Wyoming the outfitting point that season assisted Joe N. Young in forwarding the Saints and on the return trip was appointed commissary of the train.” By this time, Church leaders in Utah had discontinued the handcart companies as an inexpensive means to transport the large numbers of Saints immigrating from Europe. There was then a good supply of wagons and teams in the Salt Lake Valley and the railroad had moved further west, making it possible for teamsters to leave Salt Lake in the early spring, travel to the outfitting point where the railroad ended and bring the Saints to the Salt Lake Valley before winter set in. Orson being a young, single and likely healthy man, was called to assist with this work. It appears that Orson returned to Utah with his family in the summer of 1862. The Deseret News of September 16, 1862 included a Report on the immigration. “The day was warm in G. S. L. City. Elder Amasa M. Lyman & Charles C. Rich & Co. arrived in Salt Lake City. Capt. James Wareham’s Independent Co. members—Samuel, Lurania, Orson H. & Mary E. Eggleston; Edwin, Eliza R. Charlotte & John F. Eggleston”. The family settled in Ogden. Edwin did not remain in Utah, but returned to Iowa some time later. The parents of Orson’s wife Annie Christine Johnson came from Denmark separately. Peter Johnson was listed as Peder Jorgensen from Falster, Denmark at the time of his immigration and a member of the Lolland Conference. Peter sailed from Copenhagen, Denmark on the steamer L. N. Hvidt (S. A. Whit) on April 1, 1859. He was with a group of 355 Scandinavian Saints under the leadership of Elders Carl Widerborg and Niels Wilhemsen. They had a rather long and very stormy passage through the German Ocean to Grimsby, England. Many of the passengers suffered from sea sickness, and the ship had to set anchor a few times to wait out storms. Wednesday April 6, the Scandinavian Saints went ashore at Grimsby, then traveled by rail to Liverpool. The following day they boarded the William Tapscott, along with a large group of British and some Swiss Saints. This formed a rather large company of 726 people, who spoke nine different languages. Elder Robert F. Nelsen was made President of the company with Henry H. Harris and George Rowley as counselors. They were divided into 10 Wards; 5 English and 5 Scandinavian, with Presidents over each. James B. Bell was the Captain of the ship. The William Tapscott set sail April 11, 1859. The voyage lasted 31 days. There was only one death during the trip, with 2 births and 19 marriages. The Saints gathered for prayer every morning and evening at 8 o’clock. Church meetings were held on Sundays as well as fellowship meetings in each ward two nights a week. There were a large number of bachelors in the company, and Peter would have been among this group. There were many social gatherings with music, dancing and games. A band was organized and played on board. One Scandinavian brother, Lars Christian Pedersen was appointed to teach English lessons to the Scandinavian Saints. Peter likely would have taken advantage of this opportunity to learn English on the trip. On May 12, the ship cast anchor in New York Harbor. The next morning the passengers went ashore at Castle Garden, where they were greeted by Brother Eldridge and Elder George Q. Cannon. On May 14, they continued their journey up the Hudson River on the Steamboat “Sir Isaac Newton” to Albany, then by rail to Windsor, then Chicago, then Quincy, Illinois. From there, they went up the Mississippi River on a Steamboat to Hannibal, then by rail to St. Joseph, Missouri. Then they took another Steamboat up the river to Florence, Nebraska, arriving there May 25. At this point this large company was divided up. Some became a Handcart Company under Captain George Rowley while others were assigned to one of several Wagon companies. A Peter Jorgensen [Yorgensen] age 29 was listed on the roster for the Rowley handcart company along with a Sophia Jorgensen with no age listed. This may be an unrelated person or a family member of Peter’s, or maybe a mistake. This Sophia, though listed on the handcart company roster, was not listed on the roster for the ship. There was no Sophia listed on the ship roster whom he could have married on the voyage. There is nothing in family records to indicate that Peter was married prior to his marriage to Ane Marie. The Handcart migration was initiated by Brigham Young as an inexpensive means of bringing many poor Church members from Europe to Utah. It began in 1856 and was discontinued in 1860. A total of ten companies migrated during those years. The Rowley Company was the eighth of these ten. It consisted of 235 people with 60 handcarts and six ox-drawn wagons. This company began the trek June 11. Peter would have been assigned to a handcart with four or five other people, as he did not have a family. Each person was allowed 17 pounds of personal belongings, including clothing and bedding, which were loaded on the cart along with enough food to last the group a week to ten days. A cover of ticking was stretched over three bows on the handcart. Wagons accompanied the handcarts carrying additional food, tents and supplies. This company had some interesting encounters with Indians. The Indians demanded food and attempted to buy some of the young girls. These encounters were frightening to many of the company who had never had any previous contact with Native Americans. For most of the handcart companies, additional supplies were available at Fort Laramie, however records of this company indicated that an inventory made at that point showed a shortage of supplies. Food was then rationed. The last of their flour was distributed at Devil’s Gate. Hunting provided some game and oxen that had died were eaten. 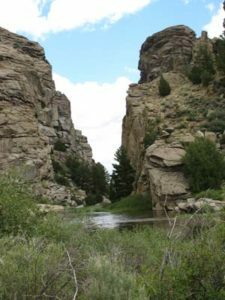 When they reached Green River August 22, they were disappointed to find no supplies there waiting for them. Finally on August 25, provisions from the Salt Lake Valley reached them at Ham’s Fork. Sunday September 4, 1859, the handcarts came down Emigration Canyon. After arriving at the Square, Elder Benson addressed the company. Then provisions were given to the emigrants by the Wards and they were warmly welcomed. Some time after arriving in America, Peter’s name was changed from Jorgensen to Johnson with the English spelling Peter. According to a history written by Stella Eggleston, Peter married Ane Marie Madsen six weeks after her arrival in Salt Lake which would have been in the fall of 1861. Ane Marie Madsen made the journey alone from Denmark in 1861. 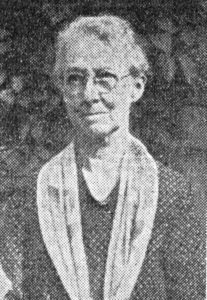 At the time of her emigration, Ane Marie was 28 years old, from Jutland, Denmark and a member of the Vendsyssel Conference, according to the ship roster. She had earned her own money for passage and preparing the clothes necessary for the journey. David Johnson’s history indicated that she sheared sheep, carded the wool, spun yarn, knitted stockings, made cloth and completed a wardrobe–two of everything including chemises. She exchanged work and materials to supply shoes and other necessities. A history by Stella Eggleston mentioned that in her hurry to get on board ship her trunk was misplaced and lost, but she came anyway. The only clothes she had were those she wore. Ane Marie sailed from Copenhagen on the steamer “Waldemar” on Thursday May 9, 1861. She was part of a company of Scandinavian Saints, with 373 Danish, 128 Swedish and 64 Norwegians. Several returning missionaries accompanied them. They arrived at Kiel the morning of May 10, and took a train to Altona, where they arrived about noon. In Altona the company was divided into two parts. One group of about 200 immediately boarded the steamer “Brittania” and departed for Hull, England. The second group of 169 stayed the night and left the next day on the steamer “Eugenia” traveling to Grimsby, England. It is not known which of these groups Ane Marie was in, but they joined together again at Grimsby. On May 14, they took a special train to Liverpool, arriving about 2 p.m. Two hours later they boarded the ship “The Monarch of the Sea”. This was the largest vessel that had carried Latter-day Saint emigrants up to that time. This company was also the largest to that date with 960 persons, the Scandinavian Saints being joined by others from England, Switzerland and Germany. On May 16 the company was organized by Presidents Amasa M. Lyman, Charles C. Rich and George Q. Cannon, who appointed Elder Jabez Woodard from Switzerland, president, with Hans Olin Hansen and Niels Wilhelmsen as his counselors. It was noted as the last ship of the season. The ship left Liverpool, England on May 16, 1861 at 11 a.m. The company was later divided into districts, The Scandinavians in seven, English and Germans into 3 or 4, each with a president. There apparently was some inconvenience in preparing food, because of the large numbers . Each family could only cook five times each week. The provisions were reportedly “good and sufficient”. The sick were given wine and beer, the adults boiled sago and the children had milk. The weather was good most of the time, but there were some high winds and icebergs. Accounts in some journals gave the impression of a rather pleasant voyage. It is interesting that David’s history stated: “In 1860, Ane left her father, mother, brothers and sisters for the Gospel’s sake and came to Zion. She came with a company of Saints across the ocean, in a steerage passage. It was a terrible stormy crossing and as she was below deck her experience was of the worst kind.” David had the wrong year and some other incorrect information. It appears he was re-telling what he had heard years ago, and some things may have become distorted or embellished through time and re-telling. Stella’s history also has inaccuracies. “The Monarch of the Sea” arrived in New York on June 19, where they were met by Elder Jones and Williams, then they lodged at Castle Garden. Apostle Erastus Snow happened to be in New York and spoke to the Scandinavian Saints in the Danish language. From New York to Omaha the company traveled by train. David related that Ane Marie rode in a cattle car on the train. Their route was through Dunkirk, Cleveland, Chicago, Quincy, and St. Joseph. The company had been divided in two parts, with one arriving at Florence July 1, and the other July 2. David’s history stated: “The Church, under Brigham Young, had organized a committee to raise a fund for immigrants. She benefitted from that fund. Each one had to turn over to the committee whatever he possessed, receiving assistance in return.” Having discontinued the Handcart migration the previous year, this was the first year that teams had been sent from Utah to assist the poor Saints, who did not have means to purchase teams and wagons. Ane Marie definitely would have been in need of this assistance. David Johnson’s history indicated that Ane Marie came in a handcart company, but this could not be possible, as there were no longer handcart companies in 1861. Most of the Scandinavian Saints received this assistance and came in Captain John R. Murdock’s company leaving Florence in the beginning of July and arriving in Salt Lake City, September 12. 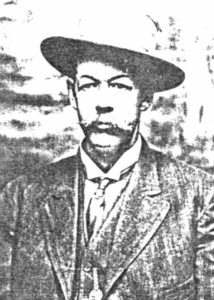 The emigrants who had sufficient means to help themselves left Florence a few days later with Captain Samuel A. Woolley with 60 ox teams. The Roster of the Monarch of the Sea in 1861 listed: Ane Marie Madsen age 28, Jutland, Denmark Occupation: Spinster, Vendyssel Conference. Another Roster of the David H. Cannon Company May 29-August 16, 1861 listed: Ane Marie Madsen age 28, 1861, Vendysal Conference, born Jutland. Stella Eggleston’s history stated: “Leaving Florence Nebraska (Winter Quarters in May 1861) she journeyed with other immigrants by ox teams to Utah but had to walk most of the way barefooted.” Her history also placed her arrival in September 1861. 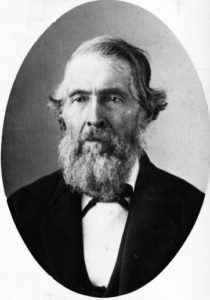 Orson H. Eggleston, along with his brother Reuben and family, came to Utah with the David H. Cannon Company, leaving May 29 and arriving in Salt Lake City, August 16, 1861. Though it is interesting to think that Ane Marie came in the same company with her future son-in-law, it would not have been possible for her to have been in this company, as they left in May and she did not arrive in Florence until July. Two ships had sailed from Liverpool earlier in that season, but it would still be unlikely they would have arrived before May 29. More likely, if Ane Marie did sail on “The Monarch of the Sea” she would have been in Capt. Murdock’s Company, which did arrive September 12, 1861. David Johnson suggested that his parents may have come in the same company, but it appears that Peter had come in 1859. Stella’s history also indicated that there was much sickness in the camp. 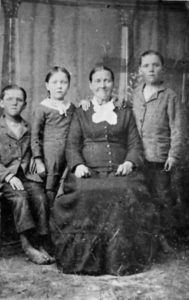 “Ane Marie was very faithful in caring for them and helping in every way that was in her power.” Ane Marie arrived in Salt Lake City in September 1861. This entry was posted in Historical Information and tagged Denmark, Eggleston, Iowa, Johnson, Nebraska, Pioneer, Utah. Bookmark the permalink.